The Houses on Parliament – (454 Parliament St, just south of Carlton) We’ve been here several times over the last few years, including while they were still at their old location which was next door to the current one. The old locale was small and cozy with a lowered patio facing the street. While it could be argued that the new location is less quaint, they are now in a beautiful renovated house with more space that retains the Cabbagetown charm. This is an upscale pub but clearly a ‘local’ complete with regulars and people stopping at other tables on their way out (neighbors, probably). The main servers are all large, friendly men, who all seem to enjoy what they do. We’ve never felt anything but welcome coming in for a late night snack, midday drink, or for the dinner rush. J loves the wide and rotating selection of drought beers. While a good pub has historically been one of B’s favourite places, not being able to have beer has tempered the love. Houses’ inclusion of the wonderful Waupoos Cider (from Prince Edward County) on the menu is greatly appreciated. Making plans over the phone it became apparent that if we didn’t get food immediately there would be dire consequences, so The Houses of Parliament was became our middle ground with service that shouldn’t take too long. 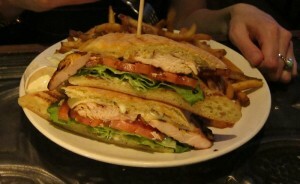 Check out the extensive menu online, but be ready for a full page of extras- the Daily Specials. It was from this menu that B selected his meal- a rack of baby back ribs atop sweet potato fries and half a roasted cob of corn. 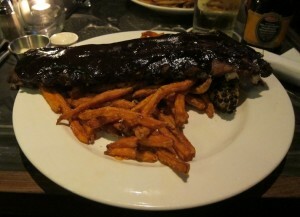 The ribs were excellent with great bbq sauce while the sweet potato fries were as good as they always are- highly recommended if stopping in for a bite and drink. J normally lusts after the spinach salad with goat cheese, pear and candied pecans but this time went for the Club, which she sheepishly requested sans bacon, and was pleasantly surprised to see that with the fantastic piece of bread and generous fillings that it didn’t feel like it was missing anything. The Houses of Parliament is highly recommend for those in the Cabbagetown area, or for anyone wanting to try some great quality pub food. Just to confuse everyone, the first real post will be about New York City. Two weeks ago we headed down for an extended weekend vacation to see friends, plays, eat and drink. The Essex – (Essex & Rivington, Lower East Side) Made reservations for brunch a week in advance (Note – many places in NYC phone to confirm reservations made on Open Table; I advise you keep your cell with you and pick up calls from unknown numbers for this reason) at this popular spot in the middle of the L.E.S. The entrance is loud and crowded, but announce your arrival to the host and they’ll get you from the mess of people. The entire menu is $23/plate with a huge variety of options catering to every diet. We tried the Vegan Mexican Matzo Brei and Challah French Toast with Bananas Foster (which reminded us of New Orleans!). Both were great. Being NYC this is a wet brunch, advertising that 3 drinks are included with each meal. We picked mimosas (naturally) and observed that 3 drinks is a mere suggestion as waiters circle continuously refilling empty (and not so empty!) glasses throughout your meal. The place has a warehouse feel and our table on the 2nd level overlooked the street with sun streaming through the large windows. Not revolutionary but a lot of fun and a fantastic way to start a vacation. Dressler – (149 Broadway, Williamsburg) A Michelin-starred restaurant just off Bedford that we walked into without a problem on a Sunday night. The art deco-inspired decor is elaborate with back-lit black metal paneling (Where’s Waldo worthy “cartoon figures” are carved into the the patterns – look closely to spot them) and ornate light fixtures. Our appetizers were the small portioned but perfectly cooked scallops and “maybe the best ravioli ever” spring pea ravioli. The other highlight was the confit breast of lamb with a crispy outside and tender, juicy inside, matched perfectly with a bed of fava beans. Unfortunately the Scottish Salmon, while being a fantastically prepared fillet, was served on a bed of asparagus risotto with spring pea puree where creaminess and citrus competed; not a good ravioli follower. The service was knowledgeable and attentive: our waiter spoke with the chef to see which items would work sans butter. Emporio – (231 Mott, just south of Prince, Nolita) Walking around Nolita, we chanced on Emporio and decided to give it a try. First, it’s perfectly located if you’re planning to spend an afternoon exploring the small boutiques that line Mott and Elizabeth Sts. in the heart of Nolita. Secondly, it makes amazing pizzas, all available made gluten free if you desire. This was the first pizza that B had eaten in over a decade! After a few bites of the (fully glutenated) Margherita pizza, J said: “Just as good if not better than Pizza Libretto on Ossington” to which B added, “The best pizza, period!” B optioned for the anchovy, caper, and olive selection – a pizza that wasn’t meant to have cheese is a good one in his books. A restaurant we have to revisit on our next trip. Osteria Morini – (218 Lafayette, Soho) Everyone we know in NYC and people online recommended Osteria so we booked online for a late meal on Monday after Sleep No More (which we can’t recommend enough!). The atmosphere is classy but casual; we didn’t feel out of place in jeans but could easily have gone all decked out. The grilled octopus appetizer wasn’t at all chewy although could have been slightly less charred while the spring onion soup was so well balanced that even B, the soup-hater, couldn’t get enough. For mains we had the Fazzoletti (ricotta & mascarpone stuffed ravioli on pesto) which was so good half the fazzolettis were devoured when B had barely touched the succulent duck breast served with fiddleheads! We agree completely with the rave reviews and add ours to the chorus as some of the best Italian food we’ve had. Didn’t hurt that the table of fashionably dressed people beside us were speaking Italian all throughout dinner. Amor y Amargo – (443 E 6th S, between A and 1st, East Village) B’s friend has been texting and Tweeting from this place for over a year trying to explain just how amazing it is, so directly after checking into our hotel on Friday night we jumped into a cab and raced straight there. It’s a small, narrow bar that specializes in bitters, amaros, and house-made sweet vermouth they serve on tap! We had time for a only a couple of drinks but as someone who is in love with bitters B liked everything on offer. Meanwhile J, more of a vermouth-wimpy, sampled from the well-curated micro-brew list. If you enjoy vermouth, order a $4 glass right off the tap and then just talk to the great guys behind the bar. Booker & Dax at Momofuku Ssäm Bar – (207 2nd Ave, between 13 and 12, East Village) They were full so we left our names and were called some 40 minutes later. The place is famous for its food and we did partake in a plate of scrumptious thinly sliced smoked ham, but the cocktails were hit and miss. B ordered a tomato-based drink – a risky choice since it’s not his favorite base, and this drink tasted almost like vinegar. Other orders were much more successful like J’s bubbly gin and tonic and it was lots of fun to see the drinks made with the super-heated iron bars or frozen with liquid nitrogen (seems like the industrial version of Paese in Toronto). Lantern’s Keep – (49 West 44th, in the Iroquois Hotel, Midtown) Recommended as the place to go after a Broadway show, we took the 10 minute walk from Death of a Salesman at the Barrymore Theatre to this tiny place with lots of class. First impressions were that the class was laid on thick as hotel bars do; this place channels grandiosity from the 1980’s just like the Park Hyatt in Toronto. Ignore hesitations, walk in, and get a place at the 4 seat bar where you’ll be treated to some of the better cocktails anywhere, let alone Midtown. We stayed until closing chatting with the bartender and the manager who had recently had a great visit in Toronto and seemed so pleased we’d stopped at his bar. Maison Premiere – (298 Bedford, Williamsburg) Did a tour of cocktail joints in Williamsburg which has really grown since B first wandered its streets a few years back. Maison Premiere is not easy to spot, so make sure you have the address in mind before venturing out and look for a cocktail and seafood establishment as you approach. The interior is done up like a cocktail den from New Orleans 100 years ago. The decor is absolutely outstanding: there were moments when we just sat with our drink and took it all in. Drink-wise you can’t go wrong. Their French 75 was so perfect J had to order a 2nd. Ask for suggestions and they’ll take you off-menu to suit your specific tastes. An absolute must. Dram – (117 S 4th, Williamsburg) Wood paneling covers Dram, floor to ceiling. Not 100% sure how this would play out in the hot summer months, but for us getting in from a violent-wind-and-rain-filled walk, it was a welcome oasis. The bartender isn’t talkative but sure knows how to make a drink: complex, interesting, and well-balanced concoctions came our way. Just tell him what you feel like and you’ll be very happy. Post Office – (188 Havemeyer, Williamsburg) It was late on a Sunday when we made our stop and so the food menu wasn’t available to munch on (sad, because everything sounded lovely). The bartender was personable and hilarious and drinks were made well. A more fun place than Dram although the drinks were less sophisticated. Bathtub Gin – (132 9th, between 18 and 19, Chelsea) The name of the bar isn’t displayed outside and when you enter you’ll see a coffee shop – totally functioning and cute – but what you want is through a “secret” door that leads into a sizable speakeasy. The specialty here is gin which right away separates it from the bourbon-soaked majority. J had a heavenly Ramos Gin Fizz while B sipped their barrel-aged cocktails. We thought the bartenders were warm and helpful; we highly recommended. The idea of this website started when I was moved back in my job to Toronto from New York and found myself wishing that I were still down there. Realizing that Toronto was also full of great places, albeit less easily accessible, this was to be a quick place to jot down thoughts on the various establishments that we found. That’s still the idea, except maybe with a little less of wishing for New York and a little more of simply celebrating what Toronto, and other cities that we visit, have to offer.